Cobham is a delightful village in the county of Surrey, England. Cobham has a very rural feel even though it is only 20 miles from London. Cobham has a population of about 10,000 and retains much of its charming village atmosphere. There is an attractive river frontage by the River Mole, a tributary of the Thames, which almost encircles Cobham, and provides a distinctly rural atmosphere in some places with views across open countryside. The picturesque riverbank has weeping willows, swans, ducks and the restored Cobham Mill. Nearby is St. Andrew’s Church, one of several churches to be found in Cobham. There are four conservation areas – Church Cobham, The Tilt, Downside and Plough Corner, where many old character properties have been retained. The thriving village centre has a good range of individual shops, many run by owner-shopkeepers, and there are two supermarkets. There are many long-established businesses in Cobham and you can find most of the goods and services you will need within its boundaries. An important attraction of Cobham’s location is that it has good road, rail and air links, being close to the M25 with access to the south west. It is equidistant between Heathrow and Gatwick Airports. The local station, some 1.5 miles from the village centre, is Cobham and Stoke D’Abernon with regular train services to Waterloo lasting 38 minutes. Cobham has an active community, and several sports and social clubs. There is a well-used Village Hall, Recreation Ground, Leg-of-Mutton Field with allotments. Other local amenity services include good Sheltered Housing and a Day Centre for senior citizens, Cobham Cottage Hospital and Health Centre, Post Office and Fire Station. 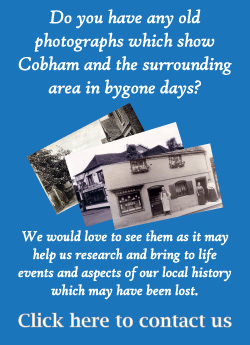 Cobham has the benefit of assigned local Community Police Officers who work within its boundaries. There is a good range of mixed housing. Cobham has one of the highest per capita incomes in the country and the Cobham postcode was recently ranked among the top ten most expensive places to live in the country. The local state school for 3-11 years is St Andrews C. of E. School and there is a good range of private schools for all ages. Cobham has a particularly high international population due to the presence of American and Dutch schools nearby. There are many good restaurants offering different styles of cuisine and hotel accommodation is also available. The surrounding areas offer good theatres, cinemas, golf clubs, health clubs, Wisley RHS Garden and more.